Over 108.7 billion emails are sent and received every day. But despite being the #1 form of communication in business, many of us are still receiving confusing or irrelevant emails – and worst of all we send them too! 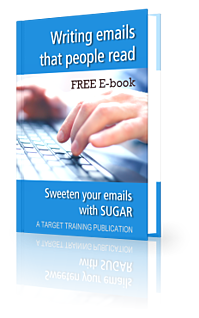 Through simple, practical tips, and the easy to remember SUGAR model, this E-book will help you to improve your emails. and won’t take up too much of your reader’s time. This eBook combines the thoughts, ideas and experience of our trainers and our clients.